Keith Gordon has fired over two collections of photos, the first is Mackenzie. Click photo below to go to the collection. The second of Keith Gordon’s collections is of Watooka. Click photo below to go to the collection. Note the improved Watooka Day School, contrast that with John’s photo below. John den hartog has secretly given us an update from his 1994 photo collection taken on his family visit to Guyana. He has some iconic imagery there. This one of the Watooka Day School, shown below, is my favorite. 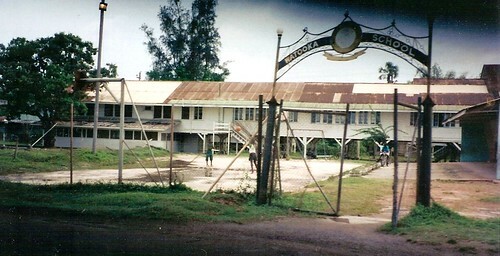 I’ve seen a modern photo of the old school somewhere on the net and the buildings pictured above have been torn down. Jerry King has a few words to say about Watooka House, click image below to get to Jerry. The golf course and railway is underwater and the road to Richmond Hill is almost gone. This devastation seems to be a result of mining operations. I wonder what is going on. A fellow that goes by the name of JimB on Flickr has some nice modern photo’s of MacKenzie, Wizmar, Christianburg and Watooka. He has two batches from 2008 and 2009. As I recollect one of his relatives lives in Watooka and if I’m not mistaken I think they live in one of the houses that I lived as a kid. I wonder if the bamboo clump is still there, makes for great rafting, but don’t use nails as she’s gonna sink. Click photo below to get to the collection. Enjoyed reading your (very well written) review of Watooka. the ultimate class separation which Watooka represented, surpassed only by the Arvida Road and Powell Crescent residents reserved for local senior management. At the time, my closest encounter with Watooka was infrequently taking lunch to my uncle, who worked in the Railway yard (shed). As a pre-teen, I was a patient at the Mackenzie Hospital, due to a cricket accident, to remove part of the handle of a cricket bat, which broke into my leg. 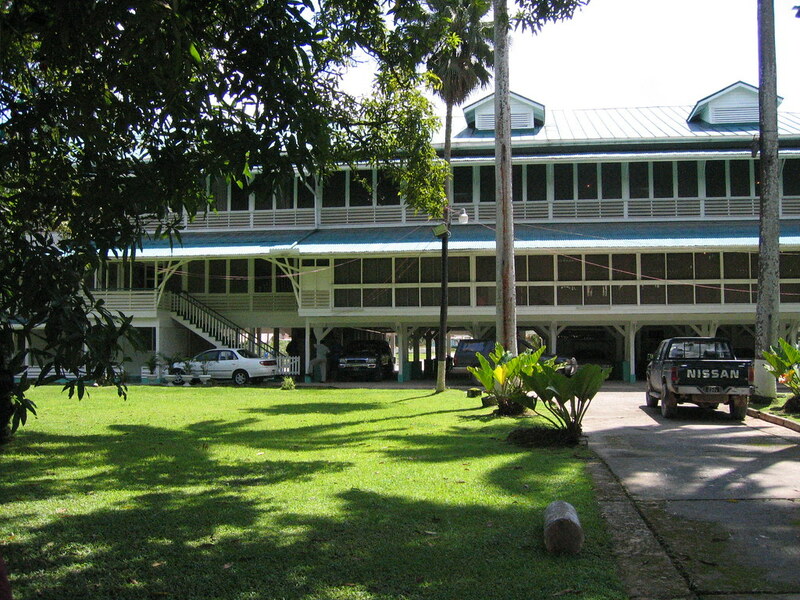 Fortunately, on one of my return vacation to Guyana and day trip to Linden to visit relatives and friends, my wife and I were able to visit with friends who lived in Watooka, the Watooka community and the stately and majestic Watooka House. I agree the Watooka House should be preserved as a historic site/monument. Please forward my support to anyone who you think will help to make this happen. BobW (Bert, Thanks for adding that tid bit concerning Arvida Road and Powell Crescent being reserved for senior management, something I never knew. I think that for some time now it has been in vogue for corporations to reward individuals with status items that are intentionally visible to all. I suspect Demba used to do this with their company provided housing in MacKenzie. Housing was offered associated with your position in the company hierarchy. Demba also did that with vehicles, the top class company managers were given white Land Rovers to drive and things filtered down from there. Today corporations still provide these “perks” but I think the practice is on the decrease. In Canada where I work now, my company gives leased cars to their senior management with the value of the cars being proportionate to their rank in the company. It’s not so visible as in the days of Demba though as the cars do not look any different than those under private ownership. Parking spots used to be given out as perks but that was removed about 15 years ago. In the last couple of years the very highest managers now have their reserved parking spots returned. To my way of thinking reserved parking should only be available to the company’s customers. I have received these pictures and comments from a friend and I love everyone of them. I have not been to McKenzie/Linden since 1961 but these pictures have brought back such nostalgia that I miss my homeland even more now. Thank you for reliving the old memories. It was nice reading about your memories of linden.The year you attended Trade School that was known as the 13TH Intake and the motto was “TOGETHERNESS”.The last time we made contact,was many year ago playing cricket in GUELTH.Which part of the world are you. Hi It was Mr.Gravesande that was in charge of the Watooka Farm, not the Alexander’s. This is Jeanette Baichulall from Richmond Hill do yu remember me, my email is jeanette.jardine@yahoo.ca, or jeanette.jardine@dhl.com, hope to hear from you. 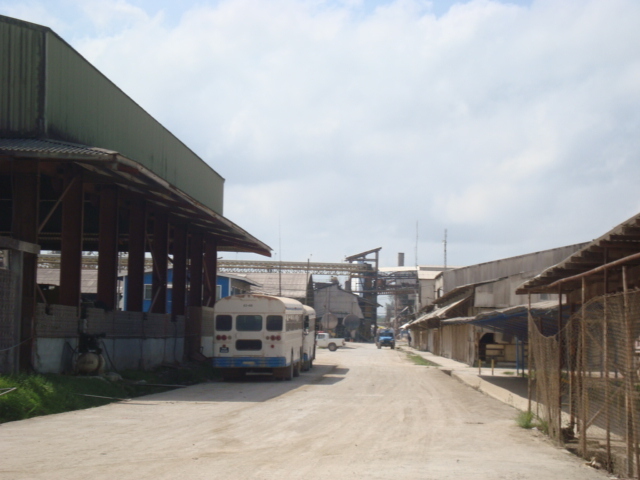 Alumina plant about four years ago or what is left of it. The picture you can’t identify is the Retrieve man road. I can’t remember the exact name of it but it’s the one which all the ovals branch off of. Any suggestion as to how to post video that is not digital. Bob, maybe will try using my digital camera to copy from television; taken in 2006. Here are some more pictures taken from video. Hope some enjoy this. My recollections of places might be wrong but what the hell. Thanks Bob for causing such nostalgic journeys and the digging up of pictures and videos. Those Gravesandes might have been cousins to the ones who lived in Manni Street. Not certain what happen to them; knew them from going to the farm for stuff. Jimmy Hamilton, Demba Digest photographer, might have left alot of photos some place; met his wife a few years ago. If anyone know where she is we might be able to recreate alot of the 50’s, 60’s in Mackenzie. Hi guys – Heard recently from Tom Wilson (Otter pilot who’s now living in British Columbia – I hope he doesn’t mind my giving out his e-mail(?!) tmwilson1@telus.net – there was a recent interview with Jimmy Hamilton in the Georgetown Chronicle newspaper which Tom sent me and then he asked me if I had Jimmy’s phone number which I don’t! I suppose if one were to contact the Chronicle that might get to Jimmy. Hi Bob, the Gravesandes may still live in Toronto. Back in the 1970’s, before I migrated to Canada, I went to school with the youngest boys (Robert and Brian). They used to be alter boys at Christ The King Anglican Church. My mother (Philippa Drakes), who lives in Toronto, still keeps in touch with the Gravesandes. Charles…I can’t remember your family name, but Thank you for the video clip. In case you are wondering who I am…my name is Peter Drakes. I lived at 275 Oronoque Drive (right next to the Assembley’s Of God Church, in Retrieve). My late father was Carlos Drakes, and my mother is Philippa. I have older siblings, Anne, Glenn, Lauren and Pamela. I am 47 years old, and left Linden when I was 16 in October 1978. I attended the Multilateral High School (now Christianburg Wismar Secondary School). I may have known you…not sure. My name is Vibert Sankar, we lived in Bourada Oval (the first house on the right as you enter the Oval). I knew your brother Glen very well(we are similar age) I had met him too in Canada in the 80’s and I remember you too as a little boy. I used to attend the church opposite you guys and your Mum would make sure you all kept quiet during the service. When last you visited? 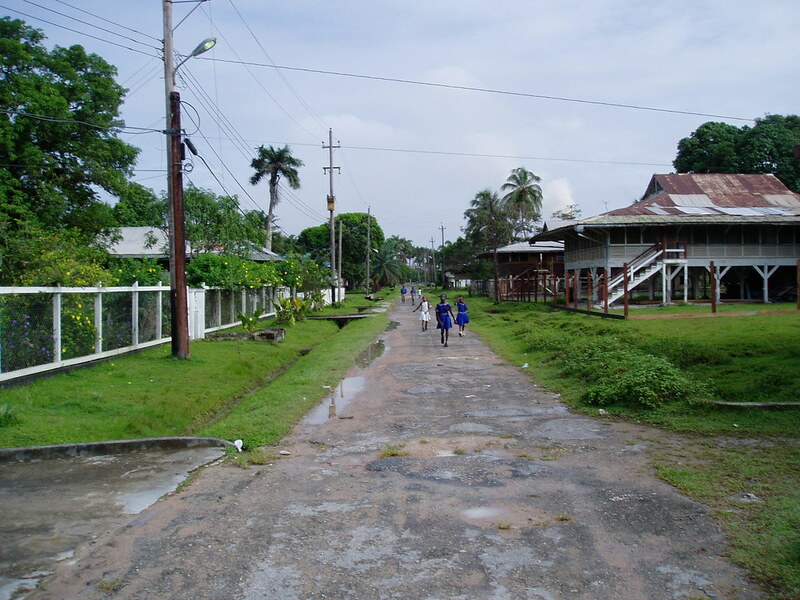 I was there (Guyana) in 2007, unfortunately I did not visit Linden but after reading the above comments, I wish I did, just for the menories. Hi Peter, Robert and Brian Gravesande are from Rainbow City. The Gravesande’s Bob is inquiring about were from the farm. Richard, Mary, Evelyn and others with their mother are living in Toronto. Mackenzie/Linden had and have alot of Gravesandes. Dennis, are you the brother of Yvette, Learner, Gail, and Pam? In other words, are you Cheboko? those individuals mentioned in the above post. Dennis Fraser (Fraze) is an old buddy who still lives in T.O. is a known Torontonian, so is his brother, “Ramsey” Hunt. popular GT hang out (Chatta) in the Apple. Marmite used to crack me up. He was a natural born comedian. If you grew up in Guyana you would certainly be acquainted with some of these common over the –counter- medicines and remedies that brought relief for various afflictions and ailments. Corner stores carried a wide array of medicines found only in the Caribbean and Guyana. These were augmented with herbal medicines and treatments before a visit to the doctor was attempted. Some of the greatest cities of old and modern times owe their rise and grandeur to their positions in the fork between great rivers, which gave them unrivaled advantages for defense and commerce. Lyons of France, St Louis in the U.S and Belgrade of Serbia are three striking examples. Bartica occupies such a unique natural location in north-central Guyana where the mighty Essequibo, Mazaruni, and Cuyuni rivers meet. Hi Guys, Love the pictures!! I too grew up in Silvertown and I do have a good one for Dmitri. We did not have corner stores, we had “CAKE SHOPS“ where we could also get a “STRAY BOY TONIC and a BUNS!! !“ Still good for a laugh whenever the guys get together. Hi Peter Drakes this is Valerie London from Yuriballi Street. I remember your family and your sister Ann was my friend. Guys it was nice reading the comments. A group of us started a Linden reunion organization called LIRA (Seventh Day Adventist based) and we hold Linden reunion weekends every two years in different parts of the USA. Commemoration – 50th anniversary of the Sun Chapman Tragedy. It would be nice if some of you are able to attend. Hello, just wanted to add a bit of additional history regarding the R.H. Carr. As a young child between the ages of 4 – 7 years old, my dad, Sonny Da Silva would leave me in charge of Mr. Gordon, then captain of the R.H. Carr. Each summer he was responsible for delivering me to my grand parents who lived in Silvertown. My grand father’s name is Manny Da Silva. Anyone on this site knew him?The family lived in Kingston until my grand father’ businesses went bankrupt during the Great Depression. My father and his siblings then grew up to Silvertown. I remember wandering around this wonderful steamer munching on sardine and cheese sandwiches. Most of my time was spent looking at the water in the river and marveling how much it looked like cola with its’ white froth. The air was fresh and salty, at least it felt that way, as I held my handkerchief over the rail, which the wind would eventually capture. I enjoyed reading all posts. Thank you. Very interesting photos, I lived on Riverside dr with my parents 1960 to 1966. Many fond memories!